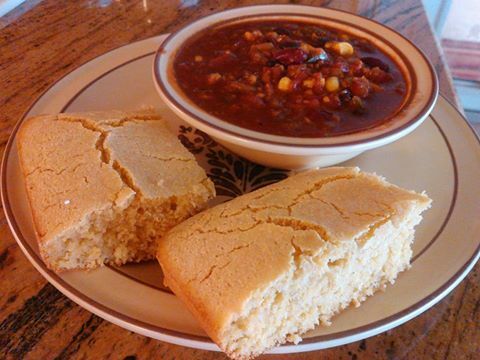 Nothing goes with certain dishes like a plate of cornbread. I enjoy it with many bean dishes, especially chili. I have been experimenting with my cornbread recipe for months and finally came up with one that I found absolutely delicious, with no added oil. Use this as your basic recipe and if you want to add to it, go right ahead. I tried it with whole wheat flour and the texture just wasn't the same. So I would recommend the all purpose flour noted in the recipe. Use a whisk to mix together all dry ingredients, then add the applesauce and non dairy milk. Stir for just a minute or so, a few lumps are fine. Bake for 20-25 min in 400 degree oven until lightly browned and toothpick comes out clean. This makes 6 servings, approx 210 calories ea.